Eight participants battled it out for top honors on Friday’s blitz tournament. The field was strong as usual, with three highly experienced experts and one master making up the top half of the table. 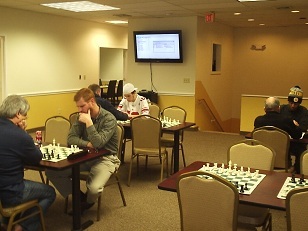 The bottom half was also competitive with four players ranging from 1100 – 1700. The excitement began in the first round with Jeff Peterson drawing twice with local Expert Raffaello Piccoli. In the 2nd round the top seeds all split while Alexander Reis and Melvin Patrick both won their matches with 2-0 scores. The game Reis Patrick in the following round had enormous implications for the winner of the U1800 prize. After two hard fought games, it was Reis who emerged with two points, almost guaranteeing him for the U1800 prize. In the final round, Reis fell twice to Harris, giving Patrick a chance to catch up if he could manage to upset Piccoli. Patrick almost pulled off the impossible comeback by beating Piccoli in the first game. However, he was unable to win again in the second game. Congratulations to Reis for winning the U1800! Meanwhile, Ian Harris and Alex Eydelman tied for first with 7/8. To break the tie an impromptu two game blitz playoff was held to determine the absolute winner. Fueled by determination, Harris defeated Eydelman in back to back games. Congratulations to him and all the winners!